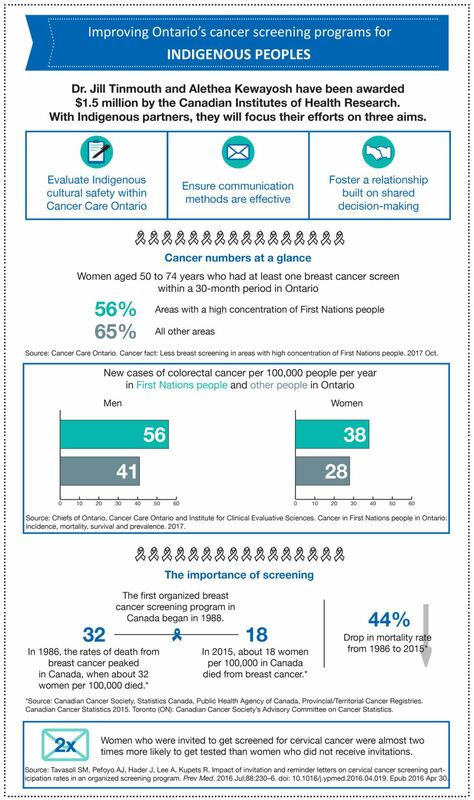 In February 2019, Alethea Kewayosh, director of the Indigenous Cancer Control Unit at Cancer Care Ontario (CCO), attended a conference of Indigenous health workers. She led two workshops, presenting on the efforts of CCO to address Indigenous cancer care. Before she began, she asked participants, who were sitting at 10 different tables, to share the first words they thought of when they contemplated cancer. “I called on the first table, and the first word that came to mind was ‘death.’ I went to the next table—‘fear.’ Then, ‘hopelessness,’ ‘sadness,’ ‘loss’ and ‘pain.’ There was not one positive word,” she recalls. With a five-year grant worth $1.5 million from the Canadian Institutes of Health Research (CIHR), Kewayosh and Dr. Jill Tinmouth, a scientist in the Odette Cancer Research Program at Sunnybrook Research Institute (SRI), aim to reverse these negative associations. Further, they intend to boost low screening participation among Indigenous peoples, thereby slowing the rise at which some in these communities are developing cancer. Evidence shows new cases of colorectal cancer among First Nations peoples in Ontario are at least 10% higher than that of other Ontarians, for example, and almost 10% more Métis women in Ontario are overdue for colorectal cancer screening compared with other women in the province. Screening programs, which inform people about the importance of tests and invite them to participate to catch cancer in its earliest—and most treatable—stages, exist in Ontario for breast, cervical and colorectal cancers. “Screening is a good tool—studies have shown that it can reduce the incidence of cancer and deaths caused by cancer,” says Tinmouth, who is also a physician at Sunnybrook and an associate professor at the University of Toronto. “I’m hoping that we start to see improved understanding of the screening programs by Indigenous communities, and I’m hoping we start to see more receptivity to participating in the three screening programs,” says Kewayosh, who is First Nations. To expand on their findings and improve the cancer screening experience of Indigenous peoples, Tinmouth and Kewayosh developed a program of research, consisting of three projects that are linked by the aim of improving cultural safety of the cancer screening system. The pair has assembled a team of researchers from CCO, Northern Ontario School of Medicine and U of T to lead these projects. Within U of T, it’s the Waakebiness-Bryce Institute for Indigenous Health and the Institute for Health Policy, Management and Evaluation that are involved. Their second aim centres on communication. In Ontario, information about screenings is distributed via mail. A 2016 study in Ontario found that women who were sent invitations for a cervical cancer screening were almost two times more likely to get tested than those women who did not receive an invitation. It’s evident that these letters are beneficial in driving up screening participation, and therefore catching cancer at the earliest possible point, but how the information in these letters is presented matters. Kewayosh illuminates the significance of clear communication when she shares the experience of many Indigenous peoples upon receiving a cancer screening notification by mail. Many people are unsettled—they don’t know why CCO is recommending a screening, and many misinterpret a screening notification as a cancer diagnosis. “These letters are really just to alert people that they’re due for a screen, but we need to make sure the communications are more sensitive and relevant to the audience to which they’re intended. A huge part of getting screening participation rates up is letting people know they’re due for a screen,” Kewayosh says. Another of their goals is to establish shared decision-making. Kewayosh says, “We want the individual to start having the control. It’s about increasing their understanding and putting them in the driver’s seat so they can make the decisions.” She underscores the idea that a screening isn’t something that is done to a person, but rather something a person opts to participate in willingly. “Shared decision-making is about trying to make sure there is communication between the provider and participant, and that there is an exchange of information around the potential benefits and/or harms of screening,” Tinmouth says. Tinmouth also looks forward to another opportunity the grant will facilitate. Embedded in the budget are resources to train students who aspire to be Indigenous scholars, and to hire and train researchers within the Indigenous communities in which this work is grounded. Where they’ll be at the end of their five-year project is difficult to predict, but Kewayosh is confident their work will breed other efforts like it. “I think this is going to be that pebble on the pond, where things start to grow and take on a life of their own,” she says. Speaking about her motivation, she adds: “I believe we’re all given gifts, and we’re all supposed to contribute in some way, from whatever little corner of the world we’re in, to help make things better. As an Indigenous person myself, I’ve always been driven by the need to help make things better for my people. For Tinmouth, it’s about delivering care that meets the patients’ needs. “[This work is] something I’m very passionate about. I believe everyone who lives in Ontario should ideally have access to the same high quality health care, and should get that health care in a way that is comfortable, respectful and meaningful to them,” she says. Dr. Jill Tinmouth and Alethea Kewayosh have been awarded $1.5 million by the Canadian Institutes of Health Research. With Indigenous partners, they will focus their efforts on three aims. Source: Cancer Care Ontario. Cancer fact: Less breast screening in areas with high concentration of First Nations people. 2017 Oct. Source: Chiefs of Ontario, Cancer Care Ontario and Institute for Clinical Evaluative Sciences. Cancer in First Nations people in Ontario: incidence, mortality, survival and prevalence. 2017. The first organized breast cancer screening program in Canada began in 1988. *Source: Canadian Cancer Society, Statistics Canada, Public Health Agency of Canada, Provincial/Territorial Cancer Registries. Canadian Cancer Statistics 2015. Toronto (ON): Canadian Cancer Society’s Advisory Committee on Cancer Statistics. Women who were invited to get screened for cervical cancer were almost two times more likely to get tested than women who did not receive invitations. Source: Tavasoli SM, Pefoyo AJ, Hader J, Lee A, Kupets R. Impact of invitation and reminder letters on cervical cancer screening participation rates in an organized screening program. Prev Med. 2016 Jul;88:230–6. doi: 10.1016/j.ypmed.2016.04.019. Epub 2016 Apr 30. Dr. Jill Tinmouth and Alethea Kewayosh are using a $1.5 million grant to improve Indigenous peoples’ cancer screening experience in Ontario. One of their aims is to gear communication messaging about cancer screening to this population. The goal is to increase cancer screening participation among Indigenous peoples, as it’s been proven that regular screenings reduce diagnoses and deaths.